Harmony Village, located at the foot of the Rockies in Golden, Colorado, is a cohousing community, dedicated to sustainable living. 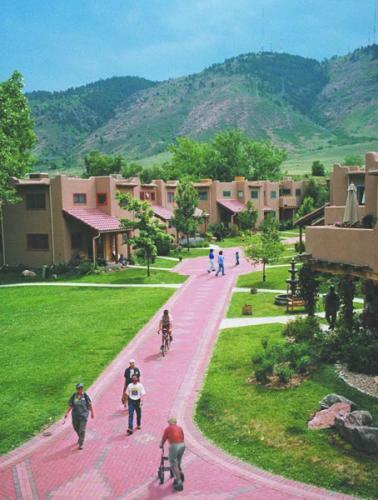 Our cohousing community opened in October 1996 and has 27 households featuring Santa Fe-style, energy efficient, clustered dwellings with common facilities and open space. Our shared mission is to create a cooperative neighborhood of diverse individuals sharing human resources within an ecologically responsible community setting. Membership in Harmony Village spans a diversity of ages, incomes, professions, and unit sizes. The "village" features a common house with a kitchen/dining area for some regular meals together, two rooms for children, common storage and laundry facilities, guest rooms, hot tub, and big screen TV. The common grounds include a large community garden, orchard, onsite workshop, and a river-rock labyrinth. Twenty-seven housing units are clustered around small courtyards and the common house to encourage interaction among residents. About half of the original site is reserved as open space. High on members' priority list from the beginning has been an ecological concern. Members seek to tread lightly on the earth, and hope this small effort to conserve our land and resources will begin a reversal of the devastating effects of ill-considered land-use policy and urban sprawl. Global change occurs one neighborhood at a time. Harmony Village intends to be part of that change.